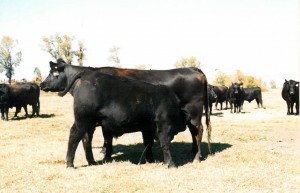 We purchased 020 as a 12-year-old cow from Yadon Angus in Manhattan, MT. I hold Bob and Sally Yadon’s breeding program in the highest regard as we have purchased both herd bulls and females from them. To this point, we have flushed three other cows besides 020 that represent Yadon’s most proven and productive cow families. A pathfinder cow, 020, along with above- average growth transmits calving ease and very good dispositions to her progeny. She is the dam of our herd sire 911 and the paternal granddam of ZRP Eliminator 008. We are awaiting her ET calves in the spring of 2015 by CH Quantum 6247, YA Universe 013, and YA Equator 548-an Equator son of 020.